TORONTO (September 3, 2014) – Corner Gas: The Movie is rolling out the red carpet for fans to be part of the upcoming film just in time for TIFF. During the Festival from September 4-13, the CORNER GAS Sing-A-Long Booth hits the intersection of Queen and John in Toronto (outside CTV’s Queen St. headquarters), giving fans a shot at being immortalized in the tail credits of the movie, premiering this December. Fans in Toronto are invited to visit the booth and belt out their best rendition of the CORNER GAS theme song, “Not A Lot Goin’ On”, written by Craig Northey and Jesse Valenzuela. Fans across the country can also get in on the fun by visiting cornergasthemovie.com and singing to their hearts content, from September 4 at 9 a.m. ET to September 18 at 12 a.m. ET (midnight). Caitlin Taylor from Saskatchewan participates in the Corner Gas Sing-A-Long. Participants will sing-a-long to a karaoke style video of the CORNER GAS theme song with lyrics rolling across the screen. Recorded voices will be mixed to create a choral mash-up for the end credits of the feature film. 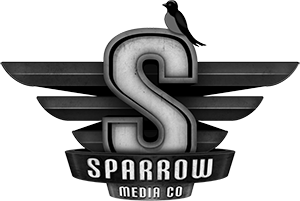 A compilation of select videos will also be created to appear in theatres, online, and in the special collectors’ edition DVD. 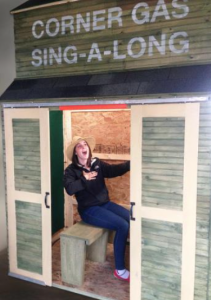 Built to look like a Saskatchewan grain elevator, the karaoke-style CORNER GAS Sing- A-Long Booth, complete with a red carpet, will be open daily from 4 -8 p.m. ET, weather permitting, and from 11:30 a.m. until 8 p.m. ET on Friday (September 5). Made of solid wood and measuring eight feet high, five feet long, and three feet wide, the booth is equipped with an iMac computer that plays the karaoke video with the words and music of the CORNER GAS theme song. The booth will be staffed by the CORNER GAS social media team, who will be uploading highlight videos on Facebook and Twitter with the hash tags #CGMSingAlong and #CornerGasMovie. Fans are also invited to meet CORNER GAS stars Eric Peterson and Tara Spencer-Nairn at the booth for an autograph signing, this Friday (September 5) from 11:30 a.m. – 1 p.m. ET. Participants in the CORNER GAS Sing-A-Long will be asked to sign a waiver before participating to give producers permission to use their voice and likeness in the film. Corner Gas: The Movie was shot in Saskatchewan from June 22 to July 22, 2014. The 90-minute feature film will be delivered to Canadians as a national event on multiple platforms in December. The first-ever release strategy of its kind, the film will open with a Cineplex Front Row Centre Events theatrical debut across Canada, followed by premieres on The Movie Network, CTV, and The Comedy Network, and complemented by a special collector’s edition DVD available for purchase before the holidays.